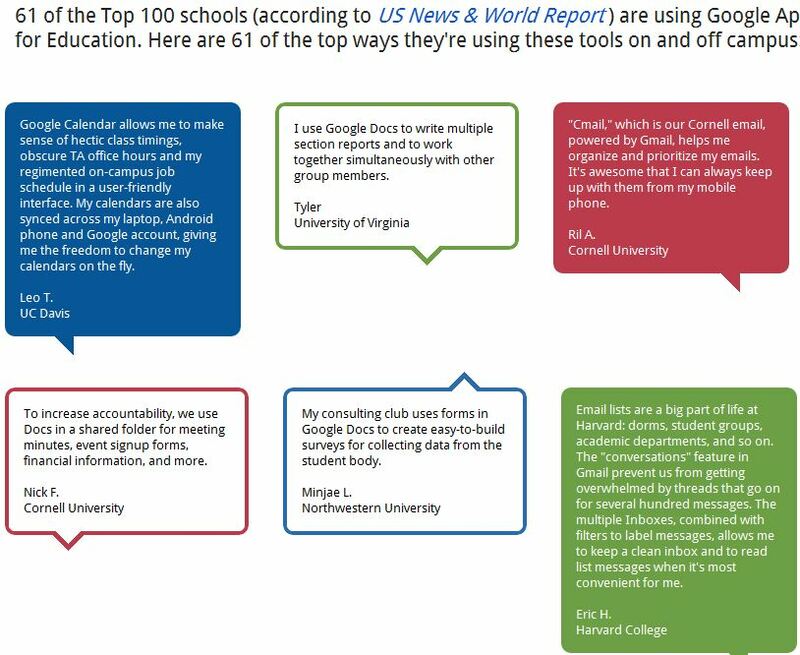 Recently, Google released a snapshot of ways students and teachers are using Google Apps for Education at 61 out of the Top 100 schools (according to US News & World Report). We’ve polled our sister independent schools across the country and have asked them to comment below on ways their schools are using this tool to improve that which they do. I don’t see how any educational institution can afford NOT to use Google Apps for Education. I suppose school’s that have $50 million endowments can really do what they want, but even then it seemed irresponsible to spend money on productivity software, email hosting and document storage not to mention network and technical support services, when Google gives you that for free and the money saved could go to teacher’s salaries and enriching the learning cycle. We moved to Google Apps with all faculty, staff, administration, and students from grades 6-12 two years ago. What we have found is that Google Apps has allowed us to begin to communicate (with Mail and Chat), collaborate (with Docs, Sites, Calendar and others), and create (with many tools, including Blogger, Sites, Picnik) in ways we could not have predicted before. Google Apps provides a platform for increasing Teacher-Teacher, Teacher-Student, and Student to Student communication and connection. For the North Shore Country Day School, it provides the framework for a collaborative learning platform to create and share documents, spreadsheets, and presentations. Google Apps is also providing a greater freedom, allowing for a greater diversity for platform and device independence. Our School introduced google docs 2 years ago, and it has been a bit of a slow, but steady go. We have had the students collaborate using them to create reports and projects and had pretty good success with Faculty sharing lesson plans and units on spreadsheets that we feel will be helpful in our curriculum mapping process. We are still using Outlook as our main source of email and calendars however. Below is an email I received that I think explains how Google Docs enhances the instructional process and facilitate a new level of communication between students and teachers. “This evening, I read a summary of a text I assign in my Philosophy in Film class, and I shared it with you for two reasons. The first is that I want to show you how bright Student X is–I am still overwhelmed by what she wrote! The second reason is that I wanted to share with you one of the merits of Google Docs. I was skeptical of Google Docs because it has caused me fits in the past. But, with Admin X’s encouragement, I decided to give it another chance, and I am so glad I did. For this assignment, students were to read an excerpt from a famous essay by Descartes dealing with epistemology. In the past, this would have been completed on MS Word. I would have read it, graded it, and returned it to the student. However, with Google Docs, I can read her work and respond to her questions in a manner that encourages real dialogue. The next time Student X reads this document, she will see my responses to her questions, and she will then be able to add her ideas. So, what was once a rather static assignment has become a dynamic learning tool for both the student and myself. We’ve been using Google apps for domains with our teachers for the last two years. Last year our AP Lit teacher used it to help provide feedback to her students using Google Docs. This year we have given every student 6-12 their own Google apps for domain account through the school and it has made everything easier for us. We have groups of students, we use Google Docs, and last year our seniors created a Google Site for our 40 year fundraising campaign. We love Google apps for domains it is very useful. Good luck with your program from Westwood Schools in Camilla, GA.
Catlin Gabel just introduced Google Apps (minus GMail) this fall. Previously, we did not have a tool well-suited to group work. Now, student or adult group members can have equal access to shared work for the duration of a project. Media Arts students are posting to a class blog embedded into a Google site and fourth grade students are exploring land forms through Maps. In our self-study year, all faculty and staff will review report drafts posted to Docs. Durham Academy Middle School went Google in November of 2010. We started only using Google Docs and Sites although now we are adding other services like Picasa, Reader, and Marketplace apps like Khan Academy and Easy Bib. Our GAE is still a walled garden in that there is no sharing outside or from outside Durham Academy. The use of GAE has transformed the learning for most of our students and teachers. I personally know I have fewer issues with lost files or files that can not be opened. Teachers have been very creative in the use of Google Docs with one Language Arts teacher using a Google Spreadsheet to both teach Spreadsheets and capture the books that students were reading outside of school. I would say the frictionless nature of GAE allows for easier adoption then most products. The main complaint I have heard is that the visible list of documents can be too much try and organize. While Collections are great, the power of Search (Google is pretty good at this) means I can find any document just by typing a search string. We are testing iPads with 6th grade and I am keen to find out how we can keep the low friction with GAE from these devices as Mobile GAE is not quite the same as computer based editing. That is one reason why a Chromebook has a big advantage. Great to see Ravenscroft adopt GAE and I will observe from Durham. Moving to Google Apps was easily one of the top 5 best decisions we have made technology-wise in my tenure as D-E’s Tech Director . The transition was smooth. The tools are intuitive. The benefits and efficiencies have been HUGE! At Jackson Prep, 6th through 12th grade, we made the decision to move all faculty, staff and administration May 2010 to Google Apps. Beginning this school year, we issued each student an account. The tools available to technology teams are excellent and well documented. Everything just works. The tools/lessons available for faculty/staff are excellent and well organized. Of course, the younger (Jr. High) students need “acceptable use” conversations…….but, technologically, the latch on well. When we looked around and saw the good community in which we were moving, this was an easy decision. I highly recommend it. Can’t beat the price. This year we have issued a Google account to all upper school students and faculty. The faculty are using Google docs more and more to post work, review, and collaborate with students. Besides the convenience of this tool it is also helping us to be a more sustainable community. At Frederica Academy,we introduced Google Apps for education last year with 6th grade as a pilot program and loved it. Now we are using GAE for grades 5-12, faculty and staff. Many teachers use it for all homework assignments and require the students to share the homework with them as a Google Doc. The teacher then grades the homework (in red) and is done…no printing and no stack of papers to carry around. Group projects are also great with the share feature in docs and presentation (Googles version of PowerPoint). Google Sites is great for portfolios to showcase student work. The collaborating, communicating, sharing, and creating that Google Apps makes possible has been very positive for our school.